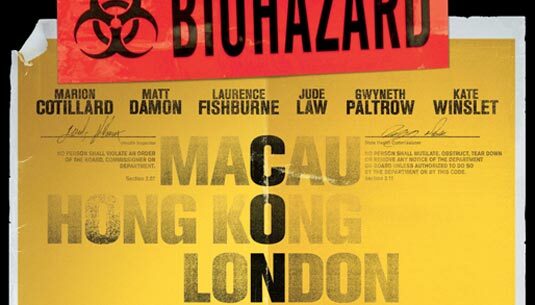 Contagion may be the best outbreak movie ever made, except for the ending. For 75% of the movie, the story builds in a quietly insidious way. The dialogue is clipped and revealing. Take for instance when one of the main characters is told early on that his wife died. “When can I talk to her” he says in a near perfect example of the Kubler Ross stages of dying, namely denial. Brilliant and moving stuff, with no melodrama. The actors do their jobs with an understated perfection. The music adds to the tension with every step. The entire story moves with the intimacy and immediacy of a good play. You feel like you’re in the room with the cast, as it’s happening. It almost feels like a documentary, as the virus rips through the population, killing 10s of millions. We see the story from multiple perspectives, all of which are unique and essential to giving us a holistic view of human nature, both good and evil, as we face extinction. The movie creeps into your psyche. You start wondering if you’ve washed your hands enough. You start thinking a lot about lines like “we touch our face an average of 30,000 times a day.” The entire movie moves like the virus itself, starting slowly and then moving exponentially. It’s filled with quiet human drama like a man finding out his wife was cheating with an ex-lover on layover, because she got infected and he did too. And yet, just at the brink, the movie pulls back. Just when I thought we’d see society unravel completely, the virus peters out. Perhaps that’s the nature of a virus. It’s here and then it’s gone suddenly. It moves with a Furies’ rage and then just dies out, having killed one too many, nature resetting itself. For that I can’t really fault the movie. It’s realistic. It feels like watching history. It all seems so horribly possible. But, it just dies off at the end. I won’t tell you how. I think you should go see the movie. It’s not an action flick. It’s a well crafted, taut drama with terrific acting and a great script to boot. It will have you thinking about touching the door after you use the bathroom when you leave the theater. But it also left me wishing that it had the guts to go all the way. It made me wish it had to courage to question the ineptness of officials and buerocracy, the way World War Z did. World War Z is in production right now. Maybe we’ll get the movie Contagion should have been, with zombies of course. Perhaps they won’t pull their last punch, the way Contagion did. It’s too bad really. The last punch could have been a knock-out.